Our museum has received a unique collection of Department 56 villages from Marilyn and Bob Harris of Lincoln, Nebraska. 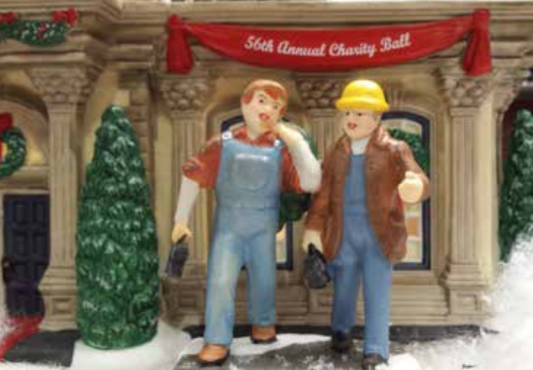 Because Christmas was such a special time in their youth, the Harris’s already had an extensive collection of Christmas dec- orations, figures, and trees when in 1984 Marilyn purchased a single Department 56 ceramic church as a gift for Bob. Since then, that single church has grown into nearly 1,200 buildings, model trains, and thousands of accessories. 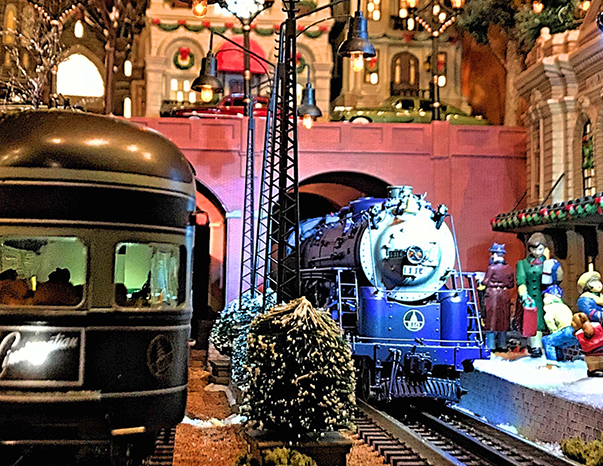 After an extensive search for a permanent home for their collection, they decided that the Colorado Model Railroad Museum would be the perfect location. Together, with the museum’s staff, it was decided that the collection would be moved to Colorado in the fall of 2018 and prepared for display for the holiday season. A special display area was created at the front of the museum to initially hold a large sample of the collection. Since Marilyn and Bob traveled extensively, over the years they were able to find rare, exclusive, or discontinued pieces tucked away in shops around the country. The result is com- plete villages including Dickens Village Series®, North Pole SeriesTM, Christmas in the City® Series, New England Village, Alpine Village, Storybook Village, Grinch Villages, Seasons Bay, North Pole Woods, Literary ClassicsTM, Hot PropertiesTM Village; Disney, A Christmas Story Village, and many other miscellaneous or exclusive pieces. The Colorado Model Railroad Museum certainly now has the most complete collection of Department 56 buildings and accessories available for public view in the United States (and probably in the world). But don’t think that model railroading takes a back seat to these miniatures. The OC&E and other railroad exhibits will always be #1. But now there’s a reason to come. 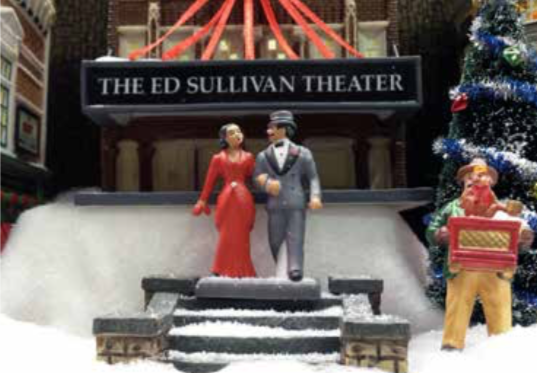 These are four of the many scenes on the new display. While the collections aren’t an exact scale, they are very close to O scale (1:48), so figures and structures will have a lot of detail. Our first display will have an Lionel loop of track around the village. Many male readers of this newsletter may not know what Department 56 is, but their wives or girlfriends probably do. 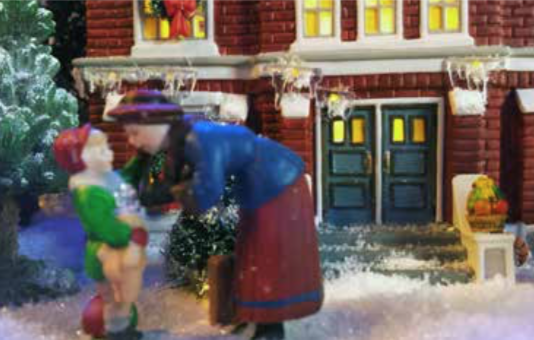 If you’ve ever seen a Christmas village diorama that has high quality porcelain buildings, that is probably a Department 56 display. in Minneapolis, Minnesota. The products were first available in 1976 and sales have grown quickly since then. 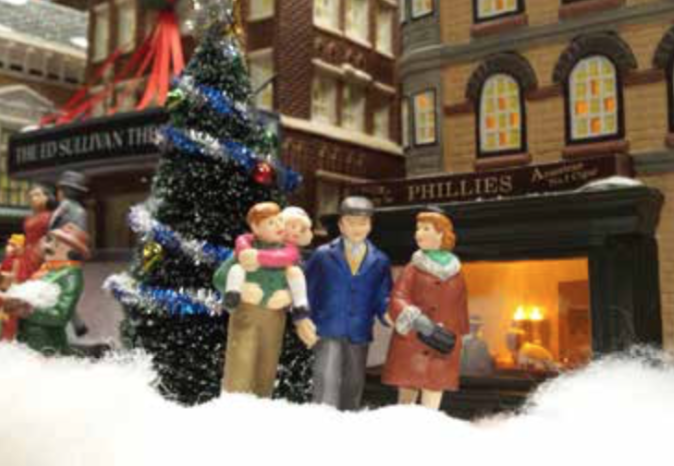 Now headquartered in Eden Prairie, Minnesota, Department 56 has become a leader in the giftware, collectibles, and holiday decorating industry and is best known for their hand-crafted lighted villages, Snowbabies ® figurines and extensive lines of holiday and home decorative products. About two-thirds of sales are via smaller gift and Christmas shops, but the most recent growth has been through national retail stores, including Amazon. In April 2018, members of the New Mexico Rail RunNers were in Greeley at the Colorado Model Railroad Museum for the first of our bi-annual trips to run trains and otherwise enjoy the OC&E Railroad and the company of some of our favorite HO modeling friends. The team in Greeley honored our dear friend and club member, Kent Shelton, who had recently passed away. As part of this honor, there was a memorial run on the layout in Greeley operated by Buzz Lenander. This run occurred on Friday, April 27, 2018, and was repeated on Saturday, April 28, 2018, and our club members greatly appreciated it. Kent had been scheduled to receive his 500-hour shirt during this visit, and sadly he never had the opportunity to wear it. During this visit, we discovered that the museum’s N Scale display was going to be retired, and there wasn’t another exhibit available to take its place. Because we are N Scale modelers, our club volunteered to create a new display module to replace the old one and presented it to the museum during the club’s next visit in October 2018. In discussing this module, we determined that we should set several goals. First, the module should be an N Scale representation of the OC&E, and it should be designed in a continuous loop to run during normal visiting hours. To this end, Doug Gary designed our track plan, that included elevation changes. We also deter- mined that we would need a water feature and bridges to reflect the OC&E vistas. In addition, there were no N Scale OC&E engines or rolling stock commercially available. This problem was resolved by Buzz Lenander, who after exhaustive research was able to find the appropriate engine and other necessary equipment. He then painted and decaled everything to fit our needs. The road numbers on this equipment reflect those of actual OC&E equipment. With the scenic vision and design planned to follow the style of the main layout at the museum, we started to construct and scenic the module. After first laying track and testing it for smooth operation, we installed the base of our landscaping using closed cell foam board secured with Liquid Nails on our base. This was set, and we began to cut and form the basic vision of the landscape. The final element for the module was that it should reflect an actual location on the OC&E right of way. After some research, it became clear that the module’s scenic design fit the landscape of Odessa, Oregon. Construction started with laying track and ensuring that it ran smoothly, followed by creating the basic terrain features and sculpting them to a general form. Doug created the mountainous terrain using Bragdon Enterprises products. The addition of resin water and a waterfall completed the general design and became Odessa Creek. Two bridges that cross over each other represented in a limited space the numerous bridges found on the original layout, and adding some struc- tural elements created the town of Odessa. With the basic landscape in place Buzz, Doug, and Jack spent many enjoyable hours putting the details and scenic elements in place. One secret element was added to this module. Some- where on the layout is a special rock called a “Belle rock.” One of our club members, Jack Dietz, once had a golden retriever named Belle who loved to bring him a rock every time she went outside. Jack kept many of these rocks, and since her death he has added a Belle rock on each of his modules and every other module that he has helped construct. Aside from a desire to bring something special to the museum, the members of the New Mexico Rail Run Ners also wanted to honor Kent Shelton, our lost club member. Kent had been a long-term club president and he loved the Colorado Model Railroad Museum. Kent was always here during the years that we have participated in the operation of this wonderful exhibit. We were overwhelmed with the CMRM museum.